Yup I just can't resist not coming here, just a few days right after opening, since my office is just around the area. Haha Forgive the Matakaw in me, but you just can't keep me away from taking on Ramen Nagi's tastefully done ramen bowls. So why the fuss? Why the lines? Well, others may say they are one of the best ramen places in Manila, others say they offer the most authentic Japanese ramen experience, for me it's the whole package! Yup, I love the festive mood, the more than robust shouting of ramen chefs, the welcoming of ushers and staffs, the colorful setting, and of course their delectable ramen. 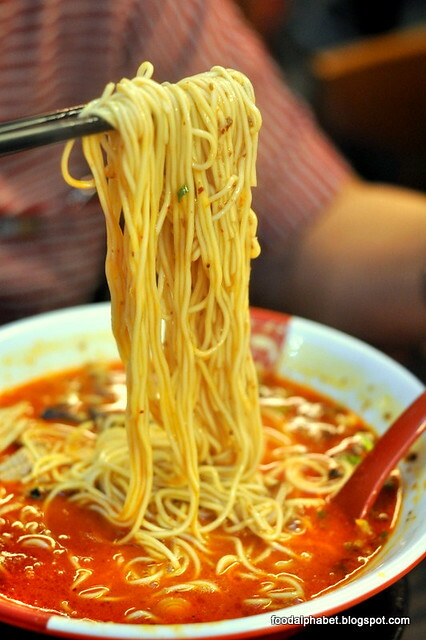 Haven't been to Ramen Nagi? Then let me take you on a crash course. Don't be surprised though as their menu is quick and is a no non-sense one, featuring only 4 kinds of ramen, yes that's it! ORIGINAL KING BUTAO - the original ramen with fire sauce and seabura, if this is your first time, I suggest you take this one so that you'd be able to taste Ramen Nagi’s tonkotsu broth and hakata noodles in its purest form. 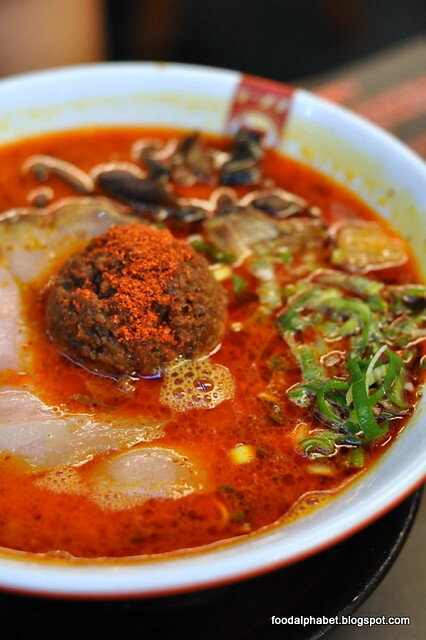 RED KING RAMEN AKAO - Craving for something spicy? Then the Red King is the rame for you! My FIL who loves spicy foods says its the perfect blend of spice and numbness, for the spice lovers, you know what that means. But still he opted to put in more chili powder! Waahh! Topped with a fireball of minced pork with cayenne pepper. You can literally smell the spice across the table, all in all Dad gave a thumbs up! By the way, you can choose the spicy level with chilis from 1 to 10, 10 being the hottest. GREEN KING RAMEN MIDORIO - a Japanese fusion ramen thats green and looks like pesto with basil, olive oil and parmesan cheese fusion with chasyu. Haven't had the guts to try this yet, as I'm not really a fan of pesto, but some of my friends are loving it. 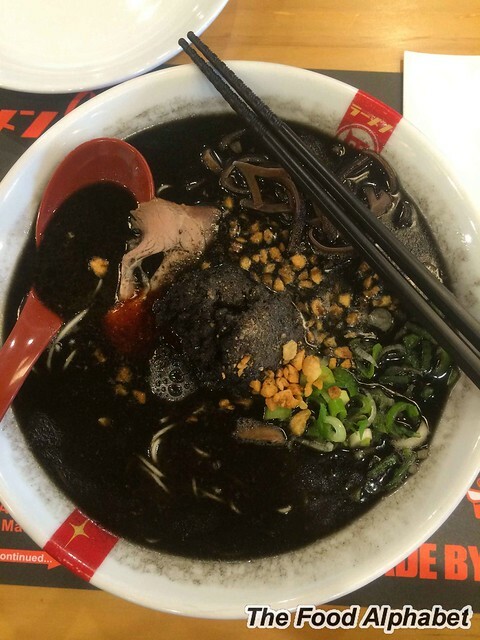 BLACK KING RAMEN KUROO - Last but not the least, The Black King! Ramen Nagi tonkotsu broth with squid ink with black ball, garlic, black and deliciously appetizing, I crossed over to the dark side and never came back, it was curiosity that got me to order Ramen Nagi’s Black King, I was kinda skeptical to have it at first but when wifey had the guts to order one, I just had to take a sip and the rest is history, it was my choice of ramen here on then at Ramen Nagi, you just got to try it to believe. Now that we're done with introduction, it's time to order! 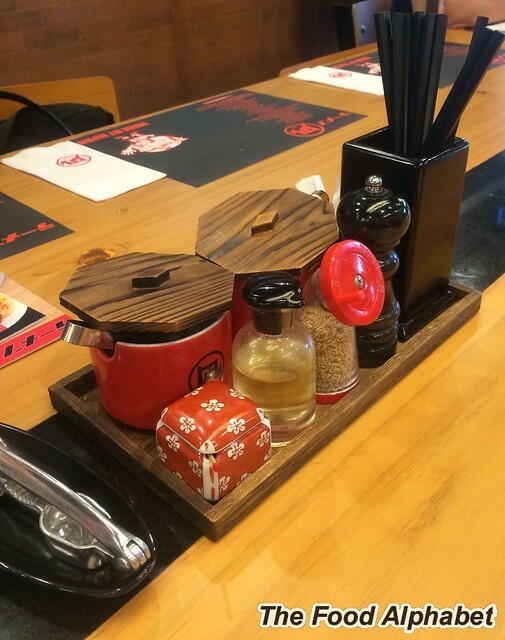 It's like made to order ramen at your fingertips! The Omotenashi Sheet has everything you need, bring out the adventurous in you and try different combinations, but I usually just check on Chef's Recommendation, so I won't go wrong. Be sure to put your name on it so the servers won't give you the wrong order, or worst your order got lost. They also have special ramens that they serve on a limited basis, when I dined there it was the Curry King, previous ones were Ebi King and Truffle Ramen King. The Red King, spiced so right! 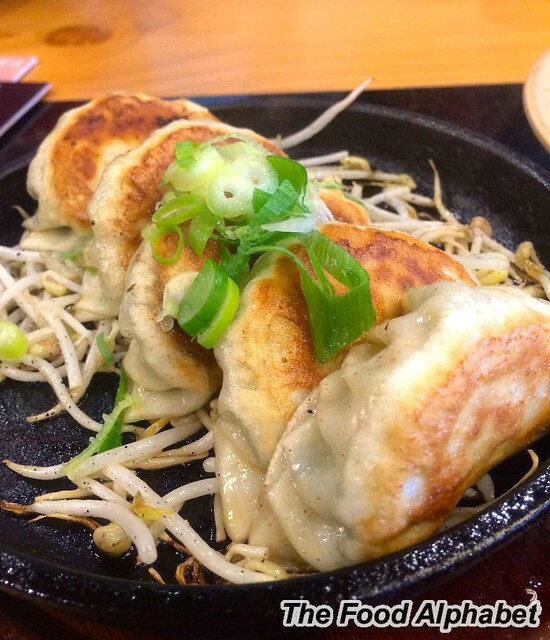 Well, they do some appetizers as well, such as Chicken Karaage,but I only liked their Gyoza, not to mention the crisp bean sprout when it gets burnt on the sizzling plate. 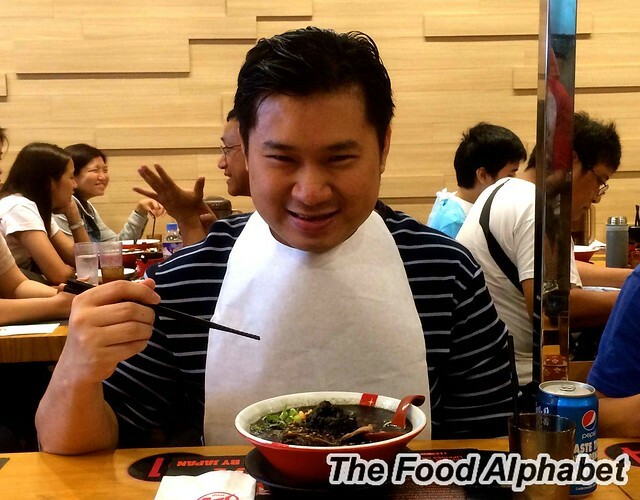 Well, rarely do you see me in pictures of my blog, but I just got to let you see this, I have a paper bib on me just like a baby huh, and trust me if you do order the Black King, ask for the paper bib, you wouldn't want to have black stains on you after your ramen feast right? 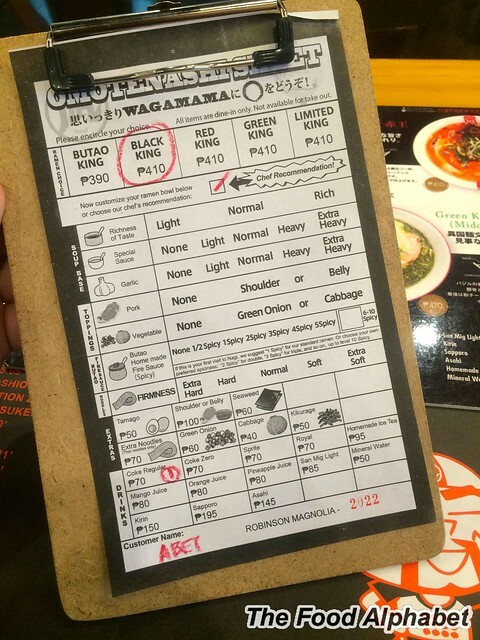 I love dining at Ramen Nagi, it takes ramen eating to a whole new experience, so do drop by Ramen Nagi at Robinsons Magnolia and have a great and fun dining experience, only Ramen Nagi can give. Happy Ramen Eating! 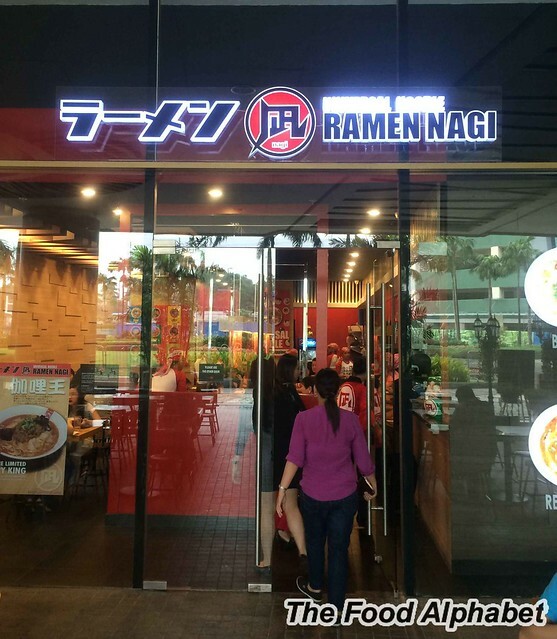 Ramen Nagi has branches in SM Aura Premier, SM Mall of Asia, SM North EDSA and Robinsons Magnolia. Visit their Facebook page : Ramen Nagi Manila for more news and promos.